Another selection of wildlife images from our camera traps in 2014. Enjoy! 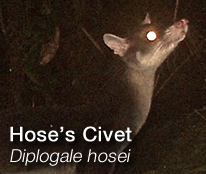 This entry was posted in HOSCAP Borneo, Photographs, Project Information and tagged banded civet, Baram, Binturong, Borneo, camera-trap, Carnivores, Conservation Project, HOSCAP Borneo, Hose's Civet, Hose's Civet and Small Carnivore Project, Malay Civet, masked palm civet, Mongoose, Muntjac, pangolin, porcupine, research, Sarawak, Sela'an Linau Forest Management Unit, Sun Bear, Ulu Baram. Bookmark the permalink.